Bulls and bears are inherently peaceful creatures. That is, only if we leave them alone. Otherwise, they attack ferociously, maiming those who dare rouse them from their slumber. One gambles when one deals with these unpredictable creatures. Is Wall Street as an organic entity, parallel to nature itself? It certainly is quite moody, given to fits of rage and fits of joy. 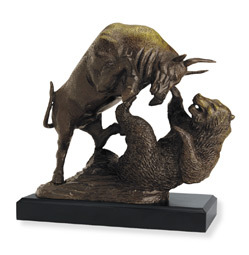 In order to make sense of the markets, we attach a binary: a fertile Bull market vs. a barren Bear market. These labels depend on a quantification of Wall Street’s daily performance. When one looks from the broadly focused view of hindsight, the status of the markets appear to be a bit more ambiguous. Based on a more general observation, Wall Street in a constant state of flux. There are those who do not wish for a Bull market. After all, there is profit to be squeezed out of a Bear market. There are companies whose stock profits by laying off hundreds of its employees. It appears to be financially responsible, and sparks an interest in purchasing its stock. Only on Wall Street can a “good” day for some be a “bad” day for all the others. It’s the simple laws of capital: you win, I lose. A truly bad day on Wall Street is a day where everyone breaks even. If nothing happens, no one wins and no one loses, and we all should have just stayed home, as if made redundant. On a bad day, the traders go home with a sense of bored neutrality. It has been said that there is no central focus to the Wall Street occupation. But does Wall Street itself have a central focus? One may say that “gaining” money is its purpose. But the market isn’t a single organic entity. It consists of individual traders who deal with the stocks of individual corporations. Each gamble against one another. Poke the bull and it charges; disturb the bear and it attacks. Leave it alone and what happens? Everyone breaks even, no one goes home feeling happy or unhappy. Wall Street would cease to perpetuate its cycle. Why demand a center when the center no longer holds?